After the successful acquisition of Kenya-based forwarder Air Connection, Panalpina is now to acquire the Dutch company Interfresh Airfreight Handling. Interfresh specializes in the customs clearance and last-mile distribution of imported perishables from Africa, Asia-Pacific and Latin America. With the acquisition in the Netherlands, Panalpina takes another significant step in building its global Perishables Network and offering complete end-to-end solutions on a global scale. 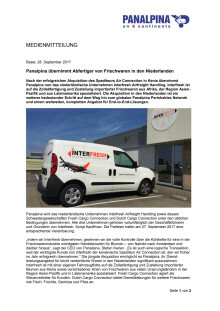 Panalpina will acquire the Dutch company Interfresh Airfreight Handling as well as its sister companies Fresh Cargo Connection and Dutch Cargo Connection, subject to conditions. All three companies are fully owned by CEO and founder of Interfresh, Sonja Kauffman. The parties reached a respective agreement on September 27, 2017. “By acquiring Interfresh we gain full control over the cool chain for one of the perishables industry’s most important trade lanes for flowers – from Nairobi to Amsterdam and beyond,” says Panalpina CEO Stefan Karlen. “It is also a logical transaction as the primary customer of Interfresh is Air Connection, the Kenya-based forwarder that we successfully acquired earlier this year.” The latest acquisition allows Panalpina to significantly expand its perishables offering in the Netherlands. 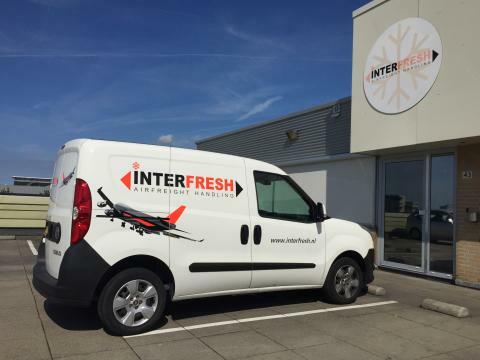 Having its own fleet of vehicles, Interfresh specializes in the customs clearance and last-mile distribution of imported flowers from Kenya and different types of perishables from many origin countries in Asia-Pacific and Latin America. Fresh Cargo Connection acts as a fiscal representative for customers and Dutch Cargo Connection provides services for other perishables such as fish, fruit, vegetables and mushrooms. Located at Schiphol Airport with offices, a cold storage facility and an experienced team, the three companies handle around 20,000 tons of perishables air freight per year. Other important origin countries besides Kenya are Sri Lanka, South Korea, Taiwan, Canada, Ethiopia, Turkey, Colombia and Ecuador. “In more than ten years we have built a solid and respected business and steadily grown our perishables volumes,” says Sonja Kauffman, who founded Interfresh in 2004 and fully owns and leads all three companies as CEO. “We are very proud of what we’ve achieved so far and now is the right time to secure further profitable growth, especially in the regions of Asia-Pacific and Latin America. 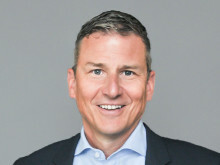 Panalpina has the global network, tools and connections to help us achieve that.” Kauffman will join Panalpina as the new country head of Perishables for the Netherlands. “The acquisition in the Netherlands is another significant step in building Panalpina’s global Perishables Network and offering complete end-to-end solutions on a global scale. It also exemplifies how we expand our presence and expertise in destination countries and at major transportation hubs for perishables,” concludes Karlen. The worldwide transport of perishables constitutes a huge market where Panalpina is aiming to become the leader. By 2020 the company, under the umbrella of the Panalpina Perishables Network, aims to be the preferred global supplier of perishables logistics, offering customers in both origin and destination countries complete end-to-end solutions on a global scale. The success factors for this accelerated and concentrated push into perishables are the company’s global coverage, dedicated perishables experts in key markets, and the unique Panalpina Charter Network. Panalpina’s perishables activities originated in Latin America and were then extended to Europe and Africa. The Panalpina Perishables Network will span 15 key countries at first, with a clear plan to double the network to cover all regions.